Soil texture is about the mineral portion of your soil. When you hear that it takes a thousand years to make an inch of soil, what you are hearing about is how long it takes to create the mineral portion of your soil. So you might think that is would be great to have a silty loam soil - but you actually have sandy loam. Guess what. You are stuck with what you have. Your soil texture is an intrinsic part of your soil. What you see is what you get. You can not change it, but understanding something about it will suggest ways to work well with it. And almost every problem you might run into can be solved or at least improved with compost. You can learn simple DIY soil texture testing techniques here. Once you know what your texture is you can come back to see what it means. Soil texture is a measurement of the mineral parts of your soil, those ground up bits of rock pulverized over the millennia. It is calculated by measuring the proportions of sand, silt and clay particles in your soil. Sand... the gritty bits. Each grain is about the size of the head of a pin. Silt... smooth and soft like flour. Each particle is about the diameter of a strand of human hair. Clay... sticky when wet. Each bit is microscopic, about the size of a bacteria. The sand, silt and clay make up the mineral part of your soil. Ideally a soil has about 45% minerals, 25% water, 25% air and 5% organic matter. Your soil texture has an enormous effect on water and on nutrients. Soil experts at the cutting edge say that 90% or more of the function of the soil comes from biology. Happily organic matter is an effective way to help deal with problems with texture. Organic matter holds nutrients very well. In the water department it can help improve drainage in clay and hold water in sand. It's an all purpose fix. With compost, mulches and cover crops even the toughest soil textures can come alive. This is a gross simplification of one of the ways plants get the nutrients they need. Below is a chart with 17 of the nutrients we know plants need to be healthy. The non mineral elements, Carbon, Hydrogen and Oxygen, plants get from the air and water. 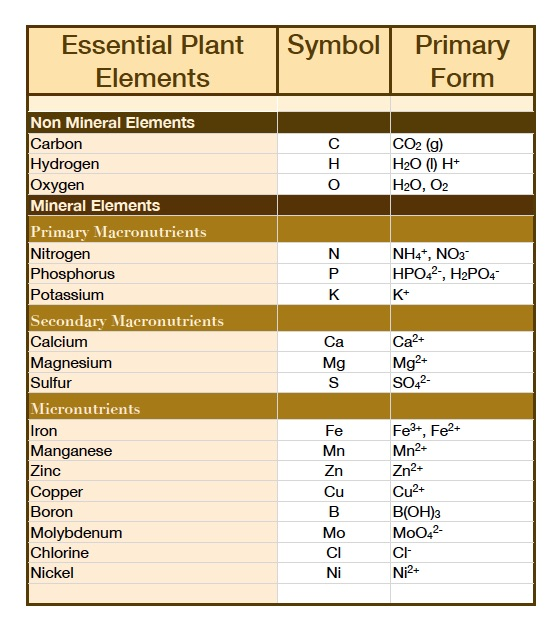 About 95% of the weight of the plant is made up from these three elements. Only about 5% by weight comes from the minerals in the soil. These are still essential to plant growth and health however. Plants take up their nutrients from the soil in ionic form for the most part. If you look closely at the above chart you'll see little + and - signs. The ones with + signs are cations. The ones with - signs are anions. Most of the essential ions are cations or ions with a positive charge. The sand and silt portions of your soil texture are essentially ground up rock differentiated by their size. These do not have an electric charge. Clay is different. Clay is a colloidal substance. It is always formed through a chemical weathering process. 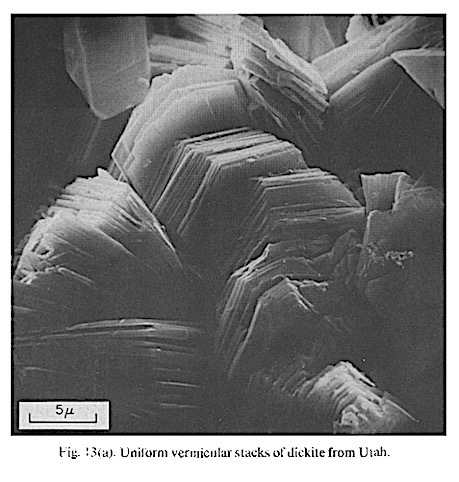 Each microscopic clay particle carries negative charges along its edges. This is where soil fertility dynamics live. They act as places to hold cations - the positively charged ions that plants need for their nutrition. Here is a photo of clay as seen through a scanning electron microscope. It lets us see the flat stacks of clay that create all the great and not so great things about clay. The negatively charged edges of the clay wafers you see above attract the cations, holding them gently in place. By gently I mean kind of like static cling as opposed to say super glue. This keeps the positively charged ions that are plant nutrients in the soil and handy for plant roots to get access to. The measure of how many cations a particular soil can hold is called the Cation Exchange Capacity or CEC. Having a higher CEC essentially means your soil has a bigger cupboard and can fill the pantry so to speak. In other words it is more fertile. The amount of clay in your soil determines to a large extent how many nutrients it can hold. The type of clay is also a factor. Clay can vary widely with CEC levels from 5 to 150. The Clay Loams - silty clay loam, clay loam and sandy clay loam have a CEC range of about 14 -30. This page offers a deeper dive into CEC if you are interested. How Can I Increase My Soil's Ability to Hold Nutrients? Happily soil organic matter, especially humus, has a very high ability to hold nutrients. Its CEC runs 150 to 300. So even though your organic matter is a very small part of the soil it has a significant impact on soil’s ability to hold nutrients. Your soil texture has a huge effect on how water moves and is stored or not stored in the soil. There are three types of water dynamic at work here. When it rains or you water your garden water moves into the soil filling all the pore spaces. Over the next few hours or days, depending in part on the soil texture, the excess water will drain away. Sandy soils have big pores so the water will drain away fast. Clay soils have much smaller pores so gravity drainage may take several days. Plants can use this water while it is present. In sandy soils this happens fast so plants living in sandy soils tend to have roots that can take up the water fast… because it drains away fast too. Once the excess gravitational water drains away there is still lots of water left in the soil. The water is held in place partly by the tendency of the water molecules to stick to each other and to be attached to the soil particles. The amount of water in the soil immediately after drainage is done is called the field capacity. Almost all this water is available for plants. This is a very thin layer of water surrounding each of the soil particles. This type of water is held so tightly by the soil that it is not available to plants. A tablespoon full of sand would cover a table while the same volume of clay would cover a football field. 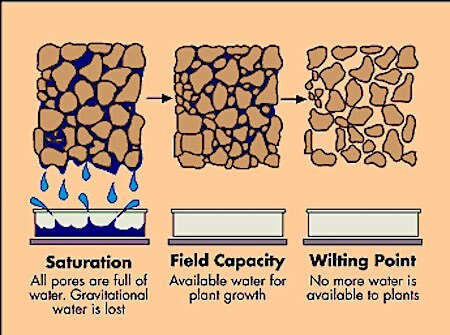 Given that this film of water covers the surface of each soil particle you’ll end up with way more hygroscopic water in clay soil than in sands or silts. This diagram shows just how much of the water in the soil is available to plants growing in soils of different textures. 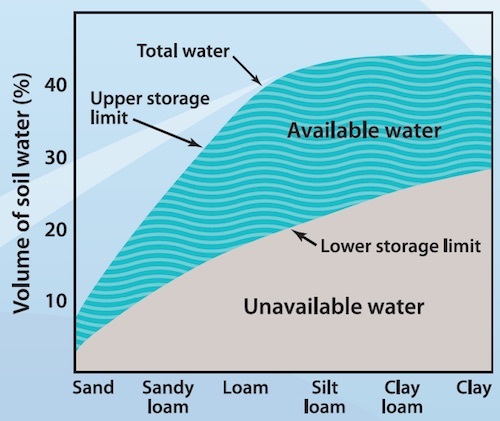 As you can see here while most water might be held in a clay soil, the most plant available water would be in a silt loam soil. How Can I Improve Water Issues in my Soil? The way we can work with soil texture is by adding compost and by maintaining some cover either living or as a mulch on the soil surface. Compost in heavy clay soils improves drainage and in sandy soils improves water holding capacity. For each 1% increase in organic matter you can store about 20,000 gallons of water per acre. The water held by organic matter would be plant available. Soil Texture Testing - if you still need to figure out your soil texture. Soil pH - to learn more about how soil pH affects your crops. Phosphorus Fertilizer of Mycorrhizal Fungi - to learn another way to get this nutrient to your plants.